DIAMOND – Clifford George Goodwin’s last day on earth was the “day that will live in infamy,” but no one knew of his fate for sure until just recently. His life and sacrifice were celebrated at First Baptist, Diamond May 12, 77 years after his death. Goodwin, an electrician’s mate hailing from Diamond in southwest Missouri, was assigned to the bowels of the USS Oklahoma along with his older brother, Daniel, a gunner’s mate. Clifford was one of hundreds of men trapped in the ship as the Oklahoma was hit by as many as nine Japanese torpedoes, and capsized within minutes. on Dec. 7, 1941. Daniel, who lived off base with his wife, immediately ran to the ship when the explosions woke him up. He and hundreds of other sailors searched for his brother and other survivors for a days. Thirty-two men were rescued from the smoldering wreck of a ship, but 429 others were lost. Because no body was recovered to provide positive identification, his family could not know with 100 percent certainty he was killed in the attack. He was simply listed as missing in action. The elder Goodwin always hoped that maybe his brother had amnesia and was lost somewhere on the island and that ultimately they would find him alive, a family member recently told the Joplin Globe. Daniel Goodwin returned with his wife, Helen, to Diamond after the war. He died in 1988, she six years later. They’re both buried in the Diamond Cemetery. And now, finally, Clifford’s remains are there as well. Last October, the Goodwin family learned from the U.S. Defense POW/MIA Accounting Agency that Clifford’s remains had been identified through DNA samples. The remains of the unidentified casualties are buried at the National Memorial Cemetery of the Pacific in Honolulu, but the agency began exhuming bodies in 2013 for DNA testing. Goodwin is one of 133 sailors and marines who have been positively identified. When the news came that he’d be identified, his niece, Tausha Johnson, who attends First Baptist, Diamond, knew that was the place to finally honor the sailor lost 77 years prior. More than 200 people attended the May 12 service at First Baptist, and not a single one of them had ever met the man. His casket was carried into the church by members of the U.S. Navy Honor Guard. 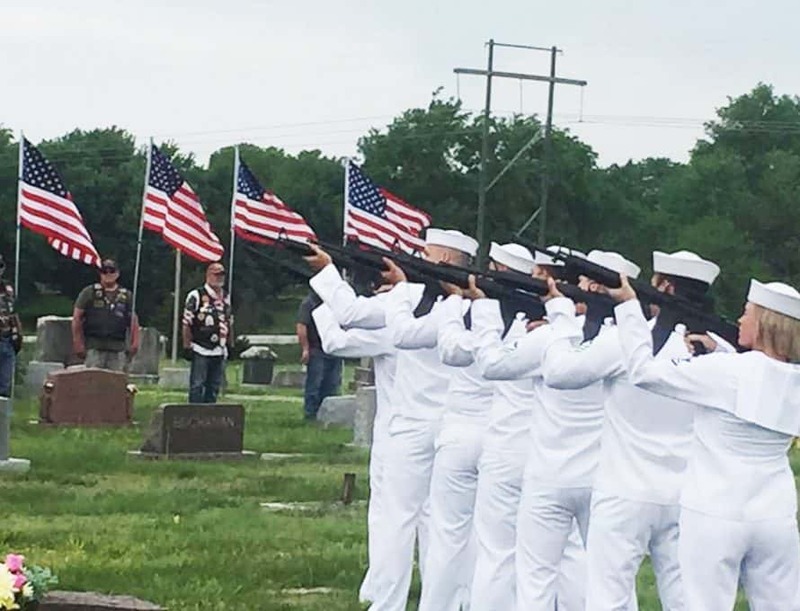 Herds of bikers escorted the hearse to the Diamond cemetery, where the bugler played taps, and the Honor Guard fired a three-volley salute, before presenting the flag that draped the casket to his next of kin. Ron Crow, pastor of First Baptist, said the church was very honored and humbled to host the funeral.